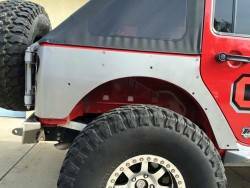 Protect the vulnerable rear corner of your 4-door Jeep JK with our masterfully-formed, 3/16" American made steel, full rear corner armor. Designed to give maximum clearance without cutting the stock quarter panels, this full corner, armor protection comes without fender flares. Includes cutouts for LED lighting!